Location: On the west side of Station Road. In Old Station Court. Present state: The old station approach road has now been redeveloped as Old Station Court with new housing. 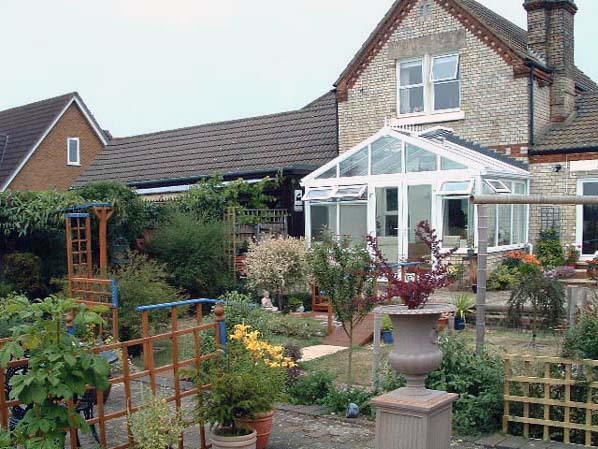 The stationmasters house and main station building have been retained and refurbished as two private dwellings with part of the platform remaining in the gardens. Notes: Travelling from Oxford in the direction of Cambridge, Blunham was the first station on the Varsity Line which was built in the architectural style of the Bedford & Cambridge Railway, a style which included strong gables in yellow gault brick together with red brick dressings and string courses. 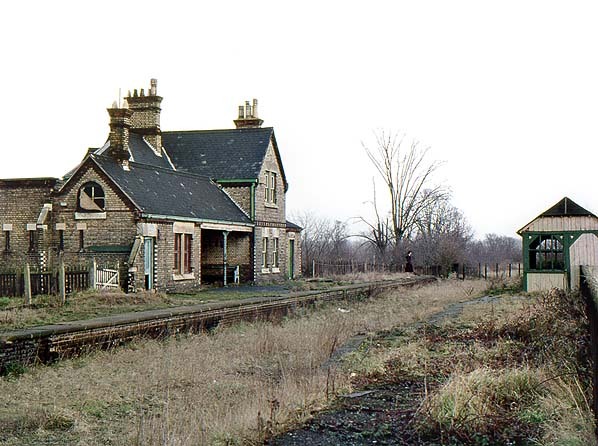 As with the other Bedford & Cambridge-built stations with the exception of Potton, the main station buildings were situated on the down side and comprised a two-storey stationmaster's house with the booking office on the lower floor. There was a single storey wing on the west side which formed and open-fronted shelter with a toilet block with narrow vented windows at its west end. An unusual wooden open-fronted shelter served for passengers on the up platform. The two platforms were low and steps were often needed to reach coaches, illuminated at night by the station's oil lamps. The platforms were surfaced with Staffordshire paviors with stone edging. Although the line was single track the station had a very long passing loop. The loop was lengthened in both world wars giving the impression to anyone standing on the platform that the line was double track. There was a small good yard on the down side. There was a long loop siding to the west of the station and a shorter siding which served a cattle dock on the down side before running through a substantial brick goods shed built to a typical LNWR design, before terminating at the rear of the down platform. The goods shed contained a 25cwt crane. 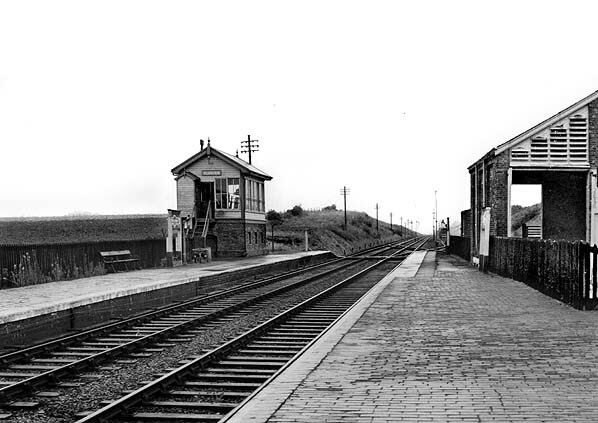 In 1879 a signal box with a 30-lever frame was provided on the up platform opposite the good shed. 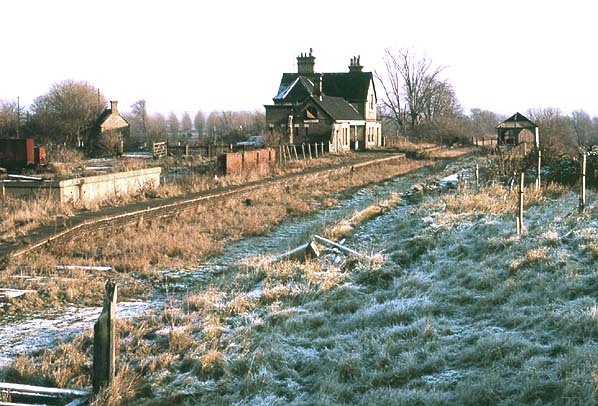 This controlled access to the goods yard and a long siding the the east of the station that ran one third of a mile to a linseed oil on the banks of the River Ivel.The station, like many others on the Bedford & Cambridge's line, saw considerable vegetable traffic - notably potatoes, leading to special trains being laid on to arrange for the collection of goods for carriage to Bletchley and onward transport to London. The station also had a healthy trade in bananas. 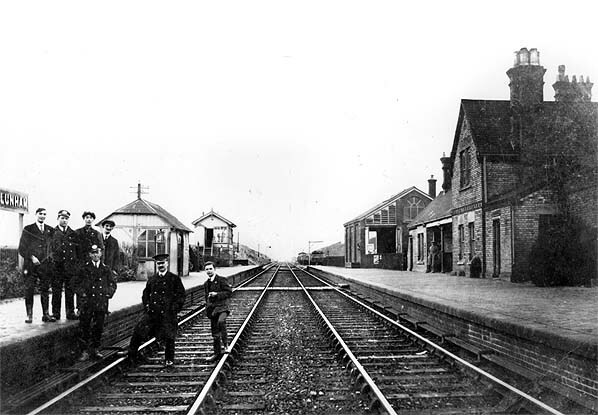 In the early years of the 20th century longer trains began operating on the Oxford - Cambridge line and the platforms were lengthened to accommodate these on 3 August 1916. 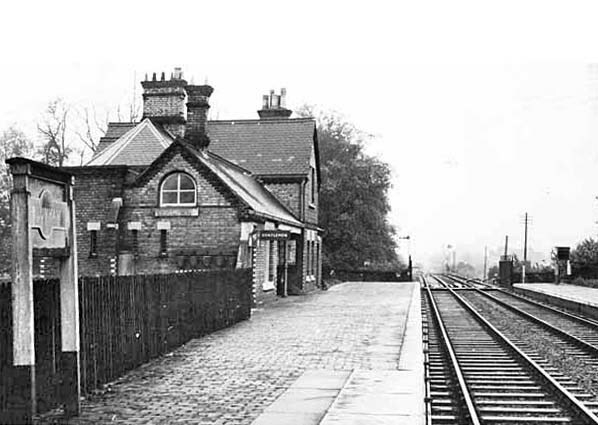 The station served a relatively rural community - there were 598 residents in 1901 - and this, coupled with its remote location to the south of Blunham village, left it susceptible to competition from the motor car. 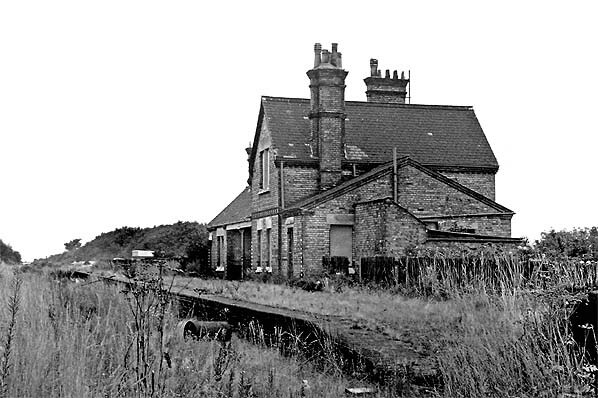 The goods yard closed on 13 July 1964 although a private siding remained in use after that date. Within two years the sidings had been lifted and the goods shed had been demolished. Although the line survived Beeching the up platform was shortened as it now only had to accommodate 2-car DMUs. Route map drawn by Alan Young, tickets from Michael Stewart. Blunham station staff on the up platform in the early years of the 20th century. The typical brick LNWR goods shed is seen on the right opposite the signal box which opened in 1879. 1901 1:2,500 OS map show the layout of the station and goods yard which had an unusually long loop siding. A secind shorter siding runs through the goods shed to terminate behind the down platform. The signal box is seen opposite the goods shed. paviors with stone edging. The platform extensions are clearly seen. 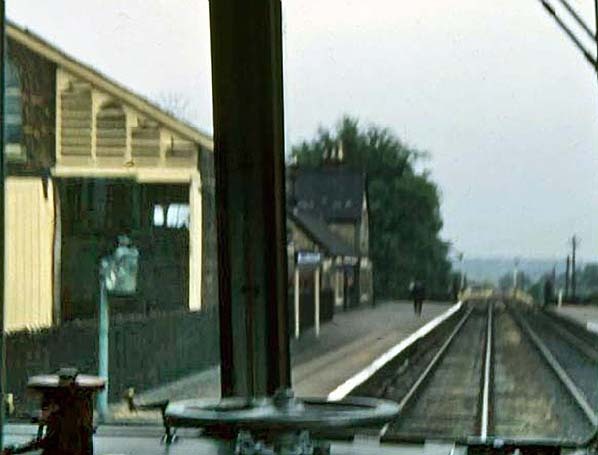 Looking east from the down platform at Blunham station c1950s. The LMS 'Hawkseye' signs survived into the 1960s. 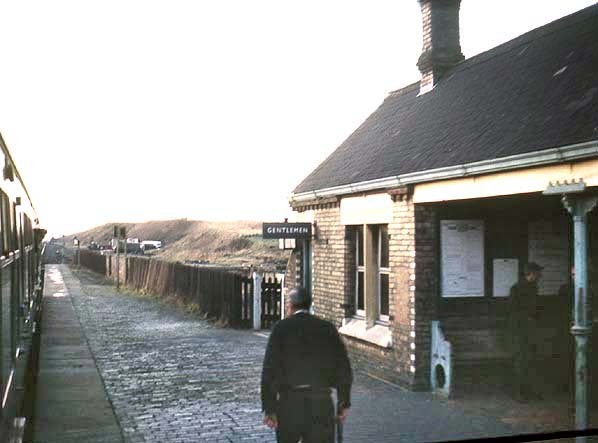 The station had a brick building which incorporated the stationmaster's house. The single-storey toilet block is seen at the end of the fence. 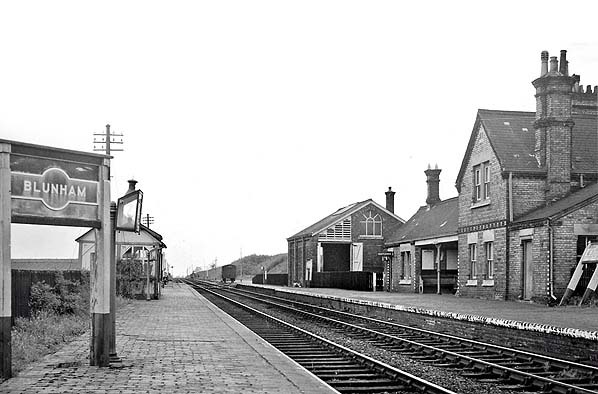 A fine view of Blunham station looking west from the up platform in April 1961. A typical angled LMS 'Hawkseye' sign is seen on the left. The sign on the right has been uprooted, perhaps awaiting its replacement; a BR eastern region blue running in board. The attractive range of brick buildings on the down platform are typical of others on the Bedford & Cambridge Railway with an open-fronted shelter incorporated into the building. Blunham station seen from the cab or a Cambridge bound DMU as it pulls into into the station. This photo was taken on 5 July 1962, the day after the centenary of the first train on the line. 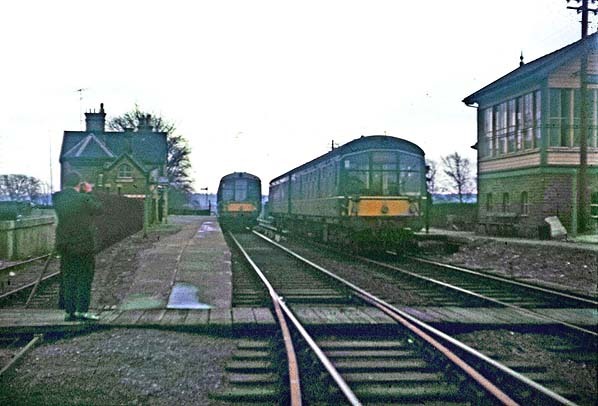 Two DMU's pass at Blunham station in March 1966. The Cambridge train stands at the down platform on the left and the Oxford train has just departed and is passing a section of platform that has been cut back. The goods yard closed on 15 July 1964 and the goods shed has been demolished. 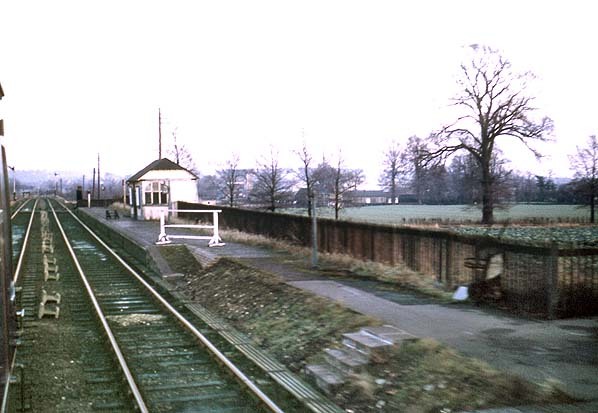 Blunham station looking west along the down platform in December 1967. Note the platform surfaced with Staffordshire paviors. The railway man is carrying the single line staff. Photo:Blunham station in Summer 2006; only the main station building survives, surrounded by new residential development.